Email notifications are powerful drivers of user engagement with SaaS apps. But not all of these messages are created equal. The best alerts convey key information and make interaction feel almost effortless, while poorly designed notifications are counterproductive and result in decreased engagement or even customer churn. I’ve received some really effective notifications. But I’ve received many more lackluster ones. I’m sure you have, too. Some were monospaced, plaintext messages spit out by a process deep in the bowels of an ancient ERP system. Others were so overloaded with competing messages, images, CTAs, and other marketing gizmos that the basic utility of the notification was lost in the noise. So, when it comes to notifications and similar transactional emails, what differentiates the good, the bad, and the ugly? In other words, what makes a great product email? Our team has looked at lots of real-world examples. Here are our takeaways. 1. The subject line is all-important. Email marketers have made an art and science of writing subject lines that yield high open rates, but remember that notifications are different from most marketing messages. While opening a message is a sign of user engagement, the most effective email notifications are written so that the subject line is the message. Even if a user never opens the alert, she or he should get what’s needed just by reading the subject line. 2. Good notifications convey just one idea. Effective email alerts are highly focused messages and a perfect illustration of when “less is more.” While the email body is an opportunity for some elaboration on the core information conveyed in the subject line, but don’t be tempted to stray from that single idea. Extraneous information or visual clutter muddies the value the of the email and distracts your user from the essential message or call to action. Overloaded notifications quickly get relegated in a user’s head to the category of “useless marketing messages” and are a sure route to disengagement, unsubscribes, and even spam flags. 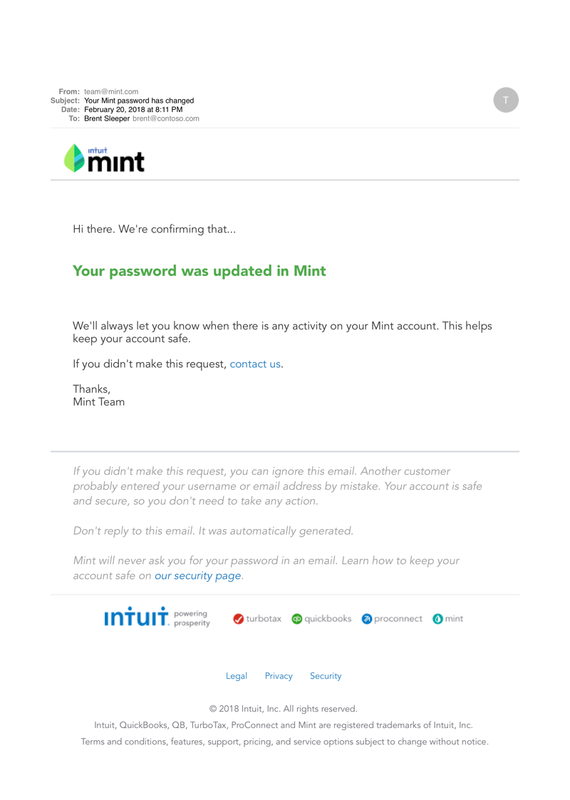 Mint’s account security notification reinforces user trust with a direct, simple message. 3. Alerts should get straight to the point with a direct call to action. Email notifications are immediate, time-sensitive, and relatively frequent. Your user will give them just a glance—you might earn 5 seconds of their time at best—so it’s not the time for subtlety. Express the facts the user needs to know and provide an obvious way for him or her to take action if needed. Done. 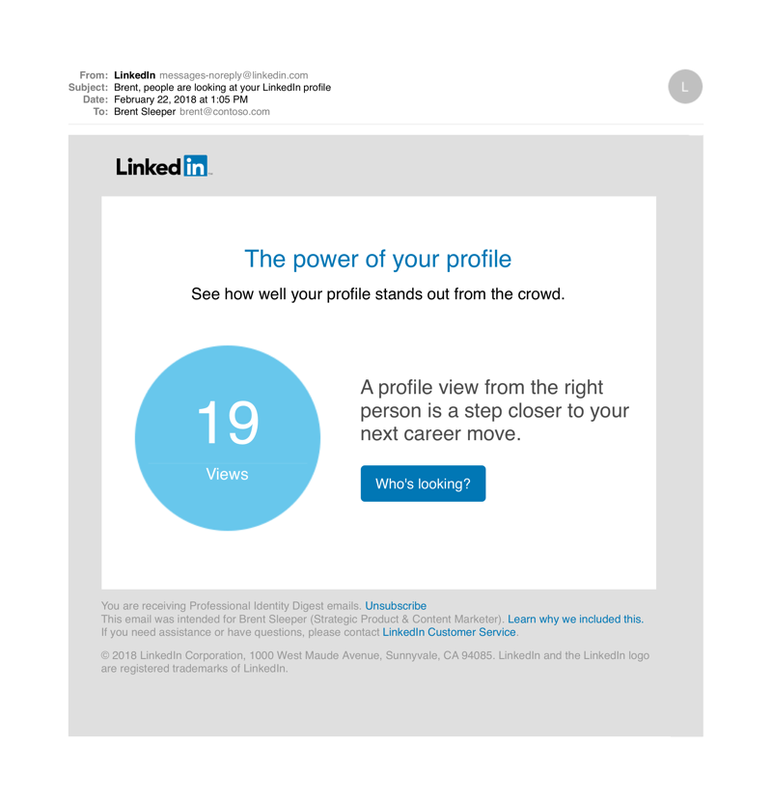 LinkedIn’s re-engagement notification has a good value proposition and clear call to action. 4. Email notifications must be highly personalized. A notification is a nearly perfect example a triggered email. It was sent in response to a specific user action or state. So be sure that the content of the message reflects that unique situation. Being personal doesn’t mean inserting a first name and leaving it at that — every bit of the notification should reinforce the user’s specific context, actions, and needs. In fact, any information that’s not specifically personalized is suspect and something you should consider removing. 5. The best notifications reinforce the user experience. Just because email notifications should be direct and succinct, they don’t need to be blandly utilitarian. In fact, the best ones are full of personality and immediately recognizable as part of the user’s overall experience with an app or service. Through tone, voice, and visual identity, email notifications have a significant impact on a user’s impression of a service or app’s style and brand. They should be designed with as much care as any other aspect of a product’s UX. 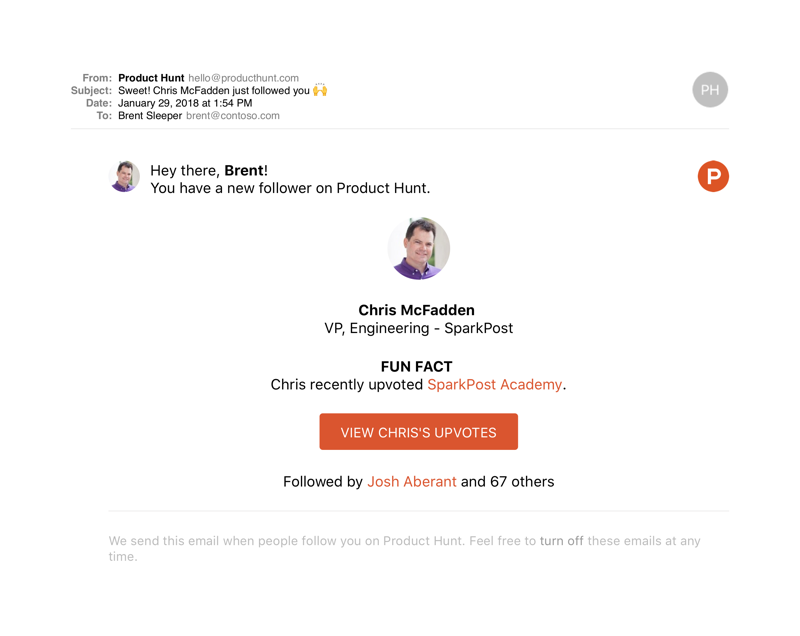 Product Hunt’s social notification hits all the right notes. Email notifications have a major impact on any app or site’s user experience, and they’re among the most important drivers of user engagement, retention, and growth. What’s your experience with email notifications and other messages? Send us a tweet! We’d love to hear your point of view and the sorts of questions you run into.